Lucia Corral, applied ecology doctoral student, was awarded the Arthur William Sampson Fellowship in Pasture Management from UNL’s Center for Grassland Studies. The fellowship is awarded annually by the center to an outstanding graduate student with a special interest in pasture and/or range management in Nebraska. Corral’s fellowship will begin Aug. 1 and run through July 31, 2017. “As a current PhD student at UNL, I view the fellowship as an honor and opportunity to represent my lab, the Nebraska Cooperative Fish and Wildlife Research Unit and the School of Natural Resources within the University and outside,” Corral said. “On a personal level, I am filled with pride knowing that my name will forever be linked with one of the prestigious and selective graduate fellowships that the Institute of Agriculture and Natural Resources has to offer. 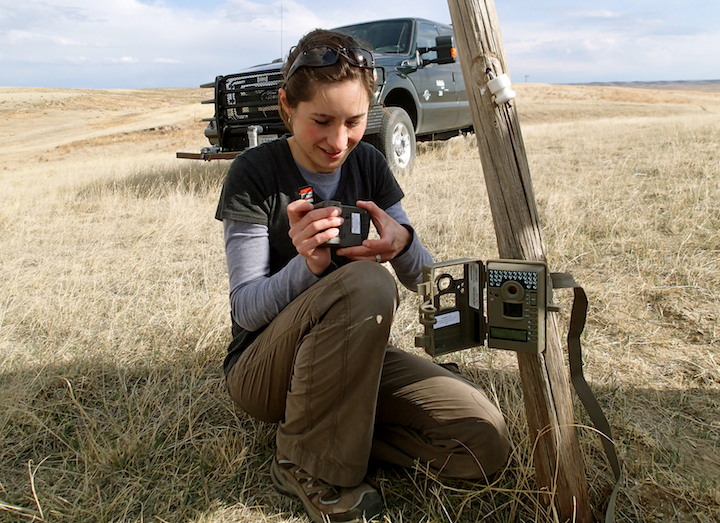 As part of her research, Corral is studying the swift fox, the rarest native canid species in the Midwest grasslands and an endangered species in the Nebraska. Dr. Martin Massengale, Foundation Distinguished Professor, President Emeritus and Director at the Center for Grassland Studies, said the fellowship is prestigious for its rarity, history and longevity. The fund supporting this program was established in 1947 and has been handled by The Center for Grassland Studies since 2003. Dr. Sampson is regarded as the father of present-day science of range management since he was the first person to employ scientific research methods in the solution of land management programs. He received both his Bachelor’s and Master’s degrees from the University of Nebraska and spent most of his career as a scientist with the research branch of the United States Forest Service and as a Professor of Forestry at The University of California-Berkley. “Lucia was selected for the fellowship because of her superior academic record, her background, her work experience and her proposal for the research to be conducted,” Massengale said.